Yikes. The first trade of the Jim Rutherford era in Pittsburgh is off to a rough start. 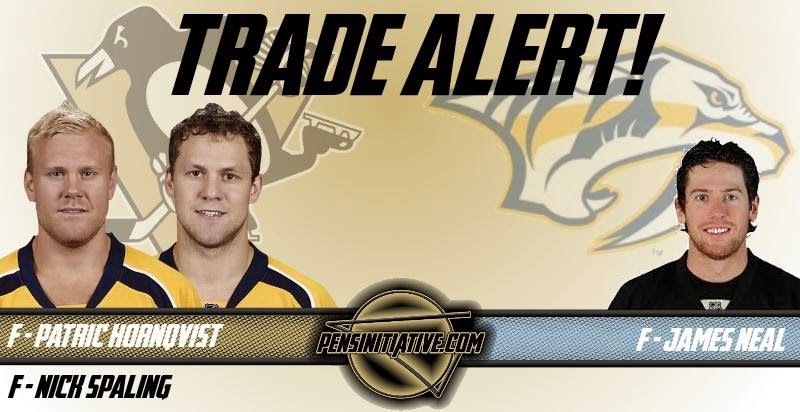 After losing out on his top candidates in the vacant coaching search, Rutherford traded F James Neal to the Nashville Predators for forwards Patric Hornqvist and Nick Spalling. Ouch. Neal, who has his flaws, is still a 40-goal scorer, is under 28 years-old, and has an extremely friendly AAV of $5 million. Obviously Neal hasn't played to well in the postseason during his time with the Pens, and he's been in trouble for dirty hits more than once or twice as well. Neal may have some character issues but his contract is worth more than what the Pens were able to get in return. In return, the Pens are getting 27-year winger Patric Hornqvist, who has 216 career points in 316 games, with 30 goals as his career high in one season. Hornqvist is probably a better two-way player than Kunitz, at $4 million per-year, he will be asked to play with either Sidney Crosby and Evgeni Malkin and he'll be asked to score more than 30 goals for this deal to be close to a success. Hornqvist is also a much different player than Neal so it will be interesting to see Malkin adjust to him instead of having Neal. Remember that Malkin and Neal developed fantastic chemistry over the years. However, Hornqvist is better that Neal at creating offense on his own, which will benefit Crosby and/or Malkin. The other good thing is that Hornqvist is compared to Kunitz as a player and was a leader in Nashville. That kind of player is certainly what the Pens need more of. The Pens also got forward Nick Spaling, who plays mostly center. Spaling is a restricted-free agent. Spalling is 25 years-old and his a career-high is 32 points in one season. Spaling currently makes $1.5 million, but will need a new contract. If the plan is to have Spaling replace Brandon Sutter as the team's third-line center, that would be a huge downgrade. That being said, Spaling can play all three forward positions and is an upgrade over guys like Joe Vitale, Tanner Glass, and Taylor Pyatt. To paint a picture of how why this was a bad deal for the Pens here's a table comparing the players involved in the trade. Neal, for all of the dumb things he does, is definitely the superior player and should be worth more than what the Pens got. Had the Pens at least swapped first round picks, let alone get any of Nashville's picks, I would certainly like this trade a little bit more. However, in the end it seems as if the Pens were dead-set on trading Neal, especially since they made this trade with a new general manager and a new coach. If you want to look for some optimism in this trade, Spaling is an upgrade over the guys that the Pens played on the fourth line last season. Hornqvist should be a 60-70 point guy playing with either Malkin or Crosby. That being said, I think as of right now you have to give Rutherord a C grading on this transaction. Had the Pens gotten more value than Spalling to go along with Hornqvist, or had they got a draft pick thrown in the deal, it would have been a lot better. For as productive as Neal has been in the postseason, he's been the opposite in the postseason for the Penguins. With just 11 goals in 38 career playoff games with the Pens, Neal has been extremely underwhelming in the Stanley Cup playoffs. Neal had just two goals and four points in his last 17 postseason games for the Penguins. That's just not going to cut it and you can certainly add Neal, who was the Penguins' fourth highest paid forward on the team. So you can certainly place blame on Neal's lack of production in the playoffs as a key reason why the Pens have disappointed the last two seasons. Perhaps the best part of Neal leaving Pittsburgh is going to be the stories that will come out about Neal in the locker room and off of the ice. Neal's attitude and the fact that he's been suspended three times does lower his value. I think it's telling the Penguins decided to trade him despite the fact that they have a new coaching staff, which includes Rick Tocchet and a new general manager. I get trading Neal, I have even said that is something they should look to do in the past, but the value just wasn't there. Overall it wasn't a bad trade, but the Pens certainly didn't get over on Nashville by any stretch.